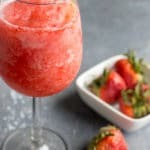 Blend up some frozen rosé wine with some strawberries and lemonade for this refreshing summertime wine cocktail. Pour wine into ice cube trays and freeze for at least 8 hours, ideally overnight. Add frozen rosé cubes to a blender, along with sliced strawberries and lemonade. Blend until smooth, stopping to stir as needed to make sure all the wine cubes are blended evenly.